An issue close to a staff member’s heart as led to over half the staff at AJ Engineering being trained in basic first aid and in how to use the in-house defibrillator. The idea of getting his colleagues trained up came from Project Support Manager Simon Hutchins who himself has experienced open heart surgery and whose wife, last October suffered a sudden heart attack. The workshop was carried out by The Sand Piper Trust whose mission is save lives across Scotland, particularly in rural areas by giving the people the right skills to do so. Simon explained why it was important to ensure the majority of staff knows how to use the equipment: “There are a few defibrillators dotted all over Forres and a wee while back AJ Engineering bought a defibrillator as it seemed like a logical step to have one on site as the quicker we can react to a heart attack the better your chances are of surviving one. 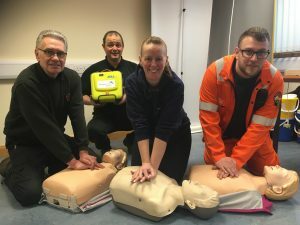 Simon added: “The training was great and although the defibrillators are relatively easy to use, having someone from The Sand Piper Trust there to explain everything and give hands-on experience has really boosted the confidence of everyone.